This one is one you’ve seen a few times, so perhaps it won’t be very exciting. My sister stopped over the other day and when I showed her the finished quilt, all she could say was “blah, boring, seen it”. And indeed, these blocks have been up on our design wall for what seems like forever. I just looked back, and it looks like I pulled fabrics for this quilt back in 2009, and made these blocks up in early 2010. I had big plans to make this a queen sized quilt with the blocks set on point. But of course, as you can see, time passed and I got busy with other things. I ended up setting other blocks on point, so I no longer felt the need to do so with this quilt. And I’m actually very happy with it as a baby quilt, not only because I can finally call it finished. I know I said I wasn’t going to make any more quilts for the baby, but I guess I lied. Add this one to the pile! 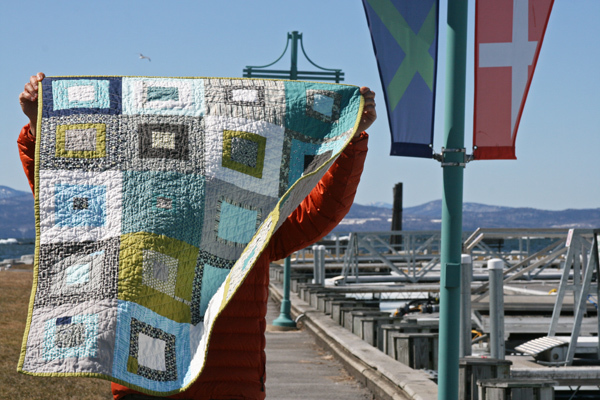 Ok, enough about the quilt, it’s time for a brisk walk… maybe that will get the baby moving?! 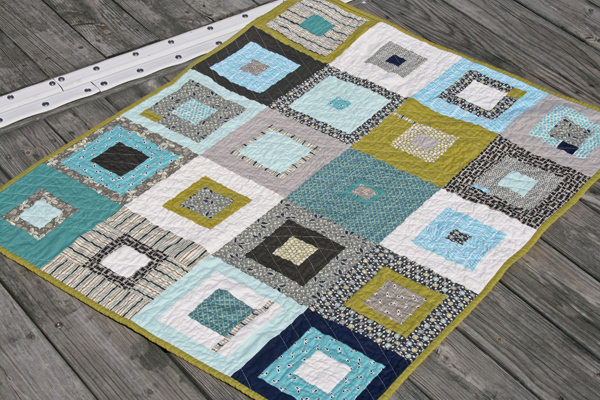 This entry was posted in [search] Square-in-Square Quilts, baby, Posts about Quilts, Quilts and tagged baby quilt, blue, denyse schmidt, flea market fancy, handmade, hope valley, kona solids, manly quilt, quilt, Quilt Blocks, quilting, square in square. Bookmark the permalink. Good morning, Ashley! In the photo of the back of the quilt, I can see a tag sticking out. I’ve never noticed those before on your quilts. Is it something new that you are doing? Could you talk about it, maybe describe it and say whether it’s a handmade tag or a manufactured one? 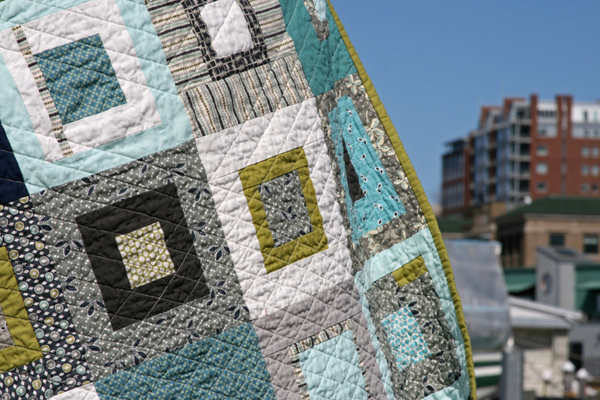 Do you date the quilts too? Thank you! I’ve had these tags for a long time – they’re pretty simple – just ‘filminthefridge’ printed on a ribbon. I can’t recall where I bought them. I’ve been mainly using them for clothing and other small project, but I recently ran out of the labels I used for quilts, so have been using these instead. I don’t date my quilts. It’s a gorgeous manly baby quilt Ashley and the nursery is perfect for the little guy. LOVE, the little man quilt! and your nursery is perfect, what a lucky little fellow. I hope your wait isn’t too much longer. I don’t think it’s boring at all! I love the colors, and the great mix on the backing. The quilting really gives it that next level of interest. Enjoy your walk! Look at those last days as bonus days, the last days in years that will be entirely yours (to sew with). I wish you all kinds of luck with the birth and your son, though I have to admit I’m secretly a little worried we won’t get to enjoy as much of your sewing for a while. Yes! Walking will get the baby moving! So will intimate times with your man and using some evening primrose oil (inserted, mind you). I just had my son a few weeks ago & I know how ready you are by week 40! Ashley – I love everything you make! Best wishes and prayers for an easy and safe birthing of your son. Please post a pic when he arrives – so excited for you! to get labour going I walk–alot!!! I’m a new reader, so the quilt is new to me. It’s great! And a baby can never have too many quilts. I totally disagree with the ‘been there, done that’ attitude. I love this quilt. I personally have difficulty matching fabrics and designs that are ‘manly’ enough and I feel like you have done a wonderful job with this one. Hopefully I will get the baby boy quilt that I am working on now done soon. Hi, I’ve been following your blog for a while now. Congratulations on the soon to be arrival of the new baby. And I just love your strip quilts. I made one last week as a gift for a new baby, and it turned out fabulous. Unfortunately I didnt get a picture of it. I like the straight line quilting, a diagram would be nice, if you have time! oh, i really love the quilting. good luck, he’ll come sometime, right? this is a beautiful quilt!! i’m curious about that lovely green in there? what color is that, if you ever have time to post…. best wishes on your soon to be big day. it won’t be long now. 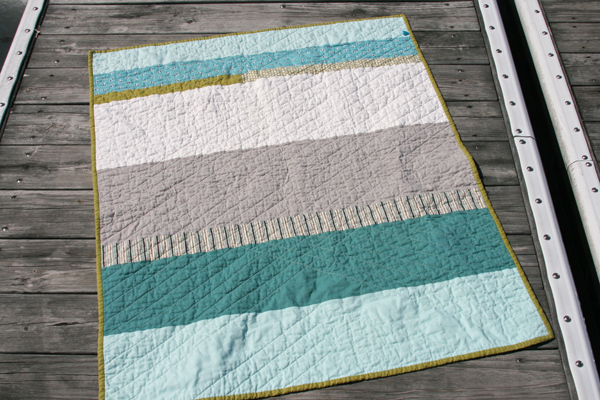 I love the blocks, but the quilting really makes it! I think you have inspired me to do something similar with a baby boy top that I just finished! This is not BORING! I love this manly quilt. Would love to see a diagram of the quilting…I love straight line quilting. My son was 19 days after my due date…longest time of my life. I did a lot of sewing! Stay busy and try to keep moving. Best wishes! 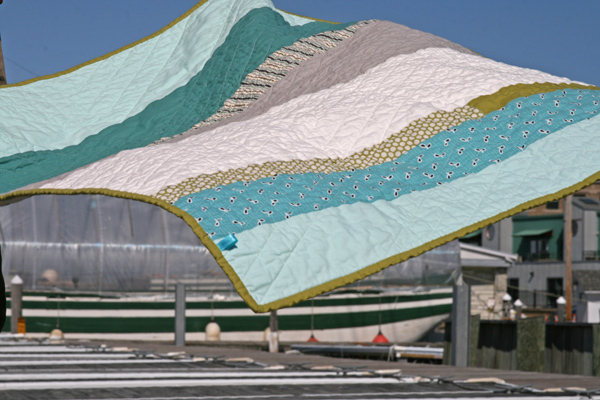 It will be interesting to see which of the quilts you have made–all so beautiful–becomes baby’s favorite. One of them will catch his eye, and you will see him carrying it all around the house as a toddler! Best wishes for labor and delivery–I am sure you are anxious to meet him! I really enjoy your blog, and find your work so inspiring. I don’t find this one boring at all! Granted, I haven’t been looking at it on a design wall for a year, but I still love it. I’d love to see a diagram of the quilting. From what I can tell, it’s beautiful. Good job for taking advatage of the opportunity to sew before the little man arrives, but be sure to get plenty of sleep, too! It is a beautiful quilt and it is great that you have something to pass the time while waiting for him :o) It is a great quilt for him to grow with not too manly and not too baby…just perfect as I am sure he will be!!!!! If that baby has not yet made an appearance, then I’m hoping for a wonderful birth experience for you! Its a very manly quilt! Love it! YES go walk walk walk until you can’t walk anymore, then walk a bit more. Good luck to you – can’t wait to see new little mr.! Please, can you tell us if you use a walking foot to quilt? 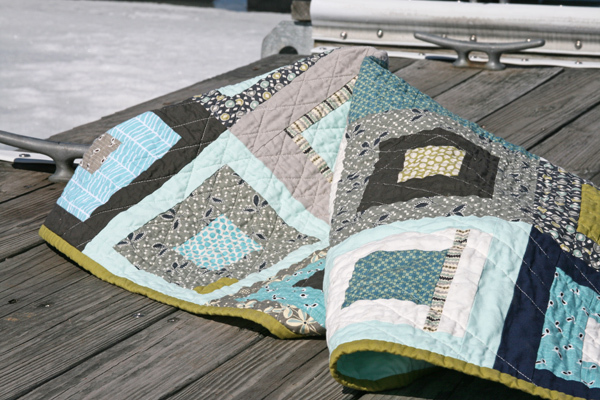 I’m so impressed by the lack of puckering – your quilting always looks so smooth! Gorgeous!! Gray, green, and blue are my favorite colors…I love this! Definitely not boring. 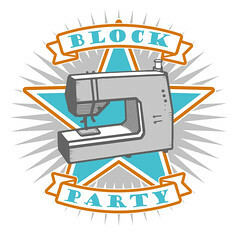 I adore the random pieces of scraps that made their way into your blocks! The tag is fabulous, too….babies love tags!!! Those blocks were meant to be a baby quilt, they suit it perfectly and will fit right into his room. I don’t think a child can have too many quilts. My boys have like 5 each and yet they still insist on stealing all the living room throw quilts. Not to mention Izzy, who seems to have another quilt to drag around with her on all her adventures every time I look at her. The best is when she covers herself with all her doll quilts, lol, seriously 6 doll quilts perfectly laid out over her little body….too cute for words. He will love them all, when he decides to come out and use them, that is. I asked my mom-in-law to make my sons matching quilts for their twin beds. She has just been waiting for me to pick out the fabric and tell her what kind of quilt. I have not found anything that has really struck my eye until now. I love this quilt. I love the grey and white and black and blue together and I think it will be perfect for them now (6 and 3 YO) but also be great for them in 15 years. 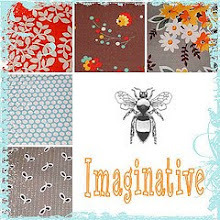 Would you be willing to share where you got the fabric/collection? Thanks so much. A friend recently referred me to your blog because I mentioned I was having a hard time finding quilts I like for boys. The currently have tan walls and dark red curtains so that might have to change but I’m just excited to have found a quilt I love. No fun when people cease to be impressed with your mad quilting skillz. …I still think it’s exciting to see the finished product. You know, your child will need a twin sized quilt at SOME point. Perhaps now would be a good time to get that done. Who knows what you will be doing when he actually needs it. Good luck, and enjoy this pause before your entire world changes. I think it’s a perfect quilt for a little boy. It’s hard to pull fabrics together for a boy that aren’t too babyish but you managed to find a wonderful combination of fabrics that are timeless. Love the quilt, boo to your sister! Is the Blue Seal restaurant in Richmond still open? If so, I know many women who swear that a spicy chicken dish on their menu is guaranteed to kick off labor! The room and the quilts look terrific. Seems like everything is ready except the little guy! Looks like these photos were taken down at what we called growing up in Burlington “the salt docks” and which is now known as “The Burlington Waterfront”. Am I right? Love the quilt by the way. I really love how this looks and the way the back looks! The colors are great! I find that your quilts quite constantly leave me awestruck and inspired and this one is no different! I am very interested in seeing the quilting. I think it looks like my favorite part of this quilt! Thanks for sharing! LOVE this quilt. The colors are beautiful! Oh please! I’d love to see a quilting diagram. I need new ideas!! yes please for a quilting diagram! Your sister is just plain silly, the quilt is not boring at all. I would love to see a diagram of the quilting as I just finished a similar quilt in all reds, yellows, and pinks, definitely a most unmanly quilt! As for the baby, he’ll come when he is ready. My daughter came precisely on her due date even though they tried to induce a week prior! Do try to enjoy these moments BEFORE baby comes. I know he’s been a long time coming, but you never get this freedom back. Then, you’ll enjoy all those moments AFTER baby comes. Maybe we just ought to enjoy every day! Hang in there! My little guy was a week and a half late, so I feel your pain! Great job on this one, I personally love it. 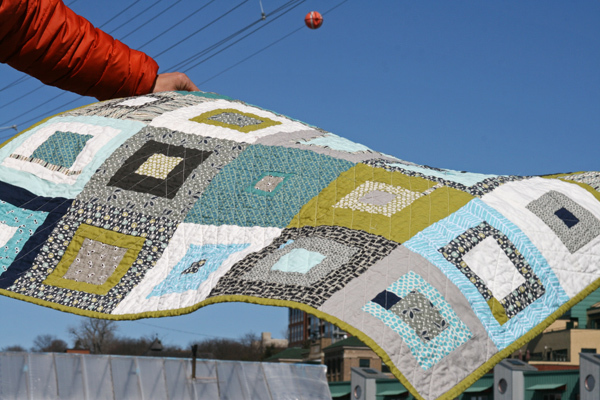 I would love to see a sketch of the quilting pattern…love this quilt!! This is Baby’s QUILT will match His room to a “T” so now he can come! HI Ashley, a customer of mine found this quilt on your blog and wants me to make it for her. Do you have a pattern I can purchase. She wants a twin or a full size. It is beautiful! Thanks so much! Hello I love love your quilt do you have a tutorial for this one or sell the pattern at all I would love to make this for my little boys bedding its perfect!! !